The Miami Dolphins protection problems may extend well beyond the offensive line. The release of a video showing now-former offensive line coach Chris Foerster snorting white lines of what's believed to be cocaine, led to his decision to step down and seek medical treatment. The images also lead to many questions about Foester’s conduct while with the Miami Dolphins. Those questions include: Who in the organization knew about his drug use? When did they know it? Did he ever use drugs while traveling with the team? Nige told Black Sports Online that she released the video because Foerster threatened to stick a “clean up crew” on her. She also said, “this is a habit that follows him everywhere he goes. It doesn’t matter if he’s in California, New York, London, it was a habit.” Notice that Nige names the three places that the Miami Dolphins have visited to start the 2017 season. I spoke with multiple league sources to get a better understanding of the Miami Dolphins and NFL security procedures. All of them spoke under the condition of anonymity. The director of Miami Dolphins security is Drew Brooks. He had been working part-time with the team for a decade, but left his job with the Pembroke Pines police department to work full-time with the Dolphins when Adam Gase became head coach. 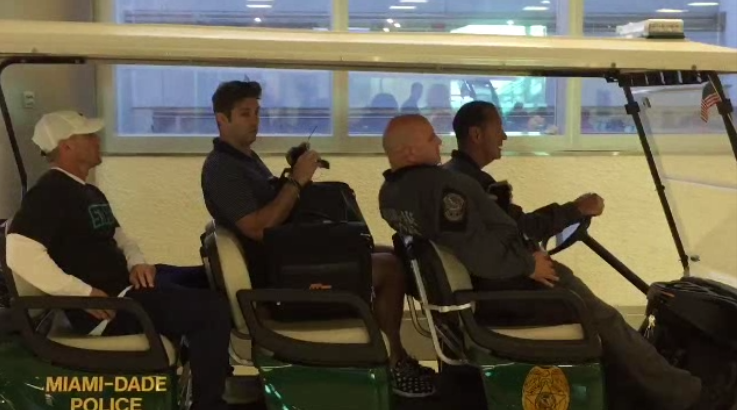 Jay Cutler arrives at MIA, escorted by Drew Brooks (left) and two Miami-Dade police officers. When professional teams travel, some use TSA or a private company to screen the traveling party before boarding the flight. The Miami Dolphins conduct the screening process at the team facility before they ever get on the bus to the airport. According to my sources, the Dolphins are among NFL teams who use their own security team to do the screening and not everyone gets checked. That would leave an opening for someone like Foerster to be able to travel with drugs. As for that Dolphins' security team, I'm told they go through course work to become TSA certified. The Foerster incident is just one of the recent scandals to rock the Dolphins during the season. Right before the opener, linebacker Lawrence Timmons went AWOL in California and headed for the airport. He was able to elude team security and forced the Dolphins to reach out to law enforcement to try to track down the 10-year veteran. Wide receiver Jarvis Landry will be meeting with the NFL later this month about a domestic incident that happened with the mother of his child. No criminal charges were filed against Landry, but that does not preclude action by the league. It’s only week 6 of the NFL season.